Livingston boss Gary Holt says he is ‘delighted’ to have finally landed the signature of defender Hakeem Odoffin, who has joined the Scottish Premiership club on a free transfer from the Cobblers. Former Norwich City midfielder Holt revealed that he had initially tried to the sign the player when he left Wolverhampton Wanderers in the summer, but the 20-year-old instead signed for then Town boss Dean Austin at the PTS Academy Stadium. Holt and his scouts have kept a keen eye on Odoffin though, and are happy to have finally got their man with a day of the January transfer window to spare. “I’m delighted to get Hakeem signed up at Livingston,” said Holt. “We have had him watched on numerous occasions since he first appeared on our radar, and have received some very good scout reports. “To be honest, he was one we were initially targeting for the summer, but the opportunity to sign Hakeem in the January window presented itself, we felt we couldn’t turn it down. “Hakeem is predominately a right-back but can play right centre-half and right wing-back too. “He is a powerful athlete and a very good footballer, and will definitely strengthen the squad going forward. “We feel we have got Hakeem at a very good stage in his development curve, and we feel Livingston FC can go on a reap the benefits in the foreseeable future. “Getting the lad in this window will benefit everyone and allow Hakeem to bed in and get a feel for the club. 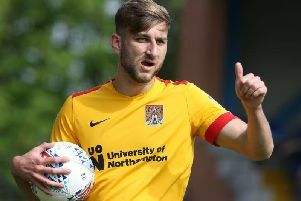 Odoffin has signed a two-and-a-half year deal with Livi, who are currently eighth in the Scottish top flight, and the deal does include a sell-on fee for the Cobblers should he move on for money in the future.